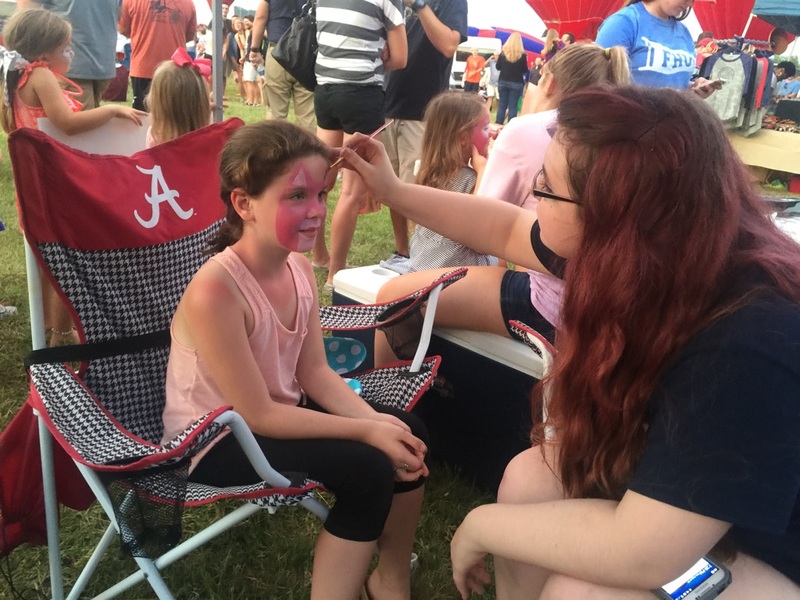 Senior Laura Beth Pickard paints a face at the balloon festival. Hot air balloons, fantastic food, fun activities for kids, tents of all kinds, and the beautiful sunset sky set the mood for Saturday night’s big event in Nashville. Nashville Christian received the honor of attending the Hot Air Balloon Festival held at Percy Warner Park on Saturday to spread the word of goal-achieving students, fantastic programs, and most importantly the word of God. Staff members Mrs. Wendy Paszek, Mr. Phillip Montgomery, Ms. Anna Wilson, and Mrs. Connie Jo Shelton come together to spread word to families from all over Tennessee about the works of Nashville Christian School and the environment of a loving & generous family guiding students to where they want to be in life. Not only did the volunteering students and faculty show that NCS is a loving and caring family, but they also showed people that we are a generous school as well. “Everything we did that day simply showed that we have a generous spirit,” said faculty member Wendy Paszek. “We were the only school tent that didn’t charge money for face-painting or waters. We gave our stuff away to spread word about our school and wanted to let people know how generous our school is on and off campus.” While staff/faculty members were taking care of business and promoting the school, current (and former) art students Sara Wilson, Laura Beth Pickard, Amanda Breeden, and Sadie Smith got to have a little fun with some face painting. Throughout the day, these artists worked together to create some beautiful pieces of work on kids and adults with free face-painting. They did anything from rainbows with pots of gold to cats to super heroes.